The element14 Great Global Hackerspace Challenge has run its course, and the number of contestants has been whittled down from 30 to three. We’ll be profiling each finalist on MAKE, starting with Chicago’s Pumping Station: One! 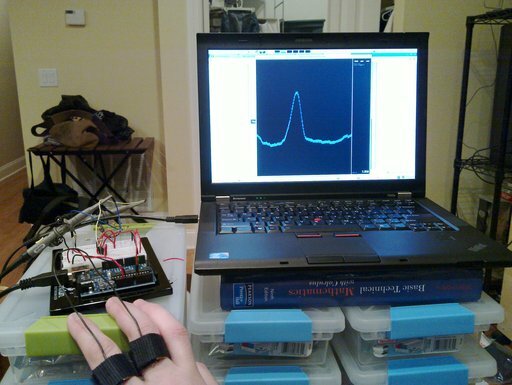 PS:One’s project was a wearable biosensor array consisting of multiple sensors interfaced through an Arduino. The sensors measure the following: body temperature, oxygen saturation, heart rate, galvanic skin response, respiratory volume/frequency, and carbon dioxide output. The stated goal of the project was to help the wearer collect his or her own data, learn how to understand it, and be able to provide medical professionals with larger data samples as needed. One of fascinating things for me as an observer was following along with the participants’ discoveries. For instance, Drew Fustini‘s excellent Galvanic Skin Response post on the element14 site taught me a lot about the technology, which is most commonly associated with lie detectors. Their final documentation (PDF) is packed with cool info about what they learned, and if you’re interested in DIY Bio I’d definitely recommend you read it. What was it like working on the GGHC challenge? This challenge offered an incredible opportunity. This project in particular offered me the chance to scratch some itches that I’ve had for quite a long time, while at the same time contributing to both the open source and educational communities. More importantly, the sense of community that formed between the participating hackerspaces was really awe inspiring. The sense of belonging to this international community of awesome hackers is probably the most important thing that I’m going to take away from this experience. How did you split up roles with your teammates? The nature of our project made splitting up work pretty easy. We started by listing all the sensors we wanted to make, and then prioritized them by ease and coolness/educational value. There were enough people with interests in different sensors that each person could take on responsibility for one or two sensors. A couple of us also took on nontechnical roles such as blogging and documentation. In coming up with a project, did the educational requirement of the contest pose a special challenge for you? How did you come up with your idea? Education is something that Pumping Station: One cares a great deal about, so the educational requirement wasn’t much of a roadblock. A lot of our members are teachers, both at the space and outside of it, or have family and close friends who work in education. After we heard about the challenge, a handful of us got together and started brainstorming. The biosensor idea was simply the one that got the most support. Tell us about the sort of student who you think would learn a lot from the Biosensor Array project. The scenario that I imagine most often is a high school health or biology class, with students split up into small groups. One student is wearing the biosensor array and the other students are watching the readout on a computer. Lesson plans could range from experimental design and data collection techniques to how the body works. One requirement of the contest is that the project be easily reproducible, what sort of skill level is needed to build the Biosensor Array? We designed the Biosensor Array to be modular, so it really depends on which sensors you want to use. 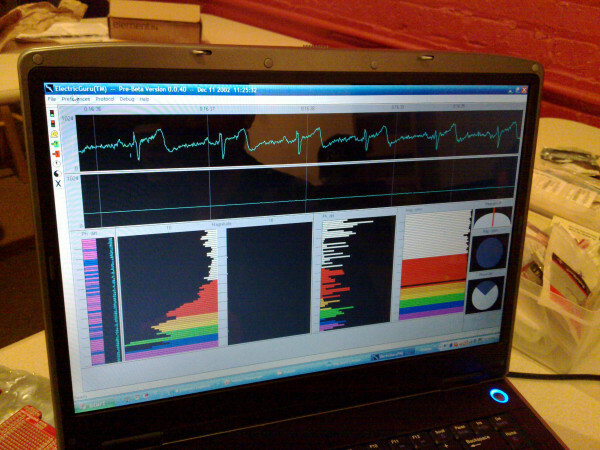 The EKG sensor was certainly the most complicated of our sensors, but some of the other ones were fairly simple. Looking over the other entries, tell me about any favorites among the ones that won or didn’t win. There were so many spaces, and so little time, that I actually found it a little difficult to follow all of the different projects. My favorite projects that didn’t win would have to be Hack Factory’s 10x breadboard and our good neighbor Workshop 88’s Educubes. I had a total “WOW!” moment when I realized, while watching the Feltronics video, that the circuit on the whiteboard was a radio transmitter! 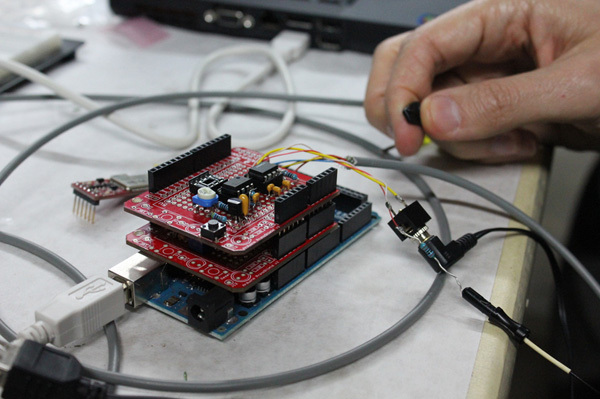 I think Feltronics will be a big help to electronics instruction everywhere including at hackerspaces. And how can one not love a giant felt multimeter! Phonicubes is both adorable and innovative. I really appreciated how they integrated different technologies into one smoothly operating device. I think it will serve children learning to read very well and would love to see a kit or even retail version produced. Beyond the finalists, I had my eye on the Big Board project by the Hack Factory team in Minneapolis from the start. 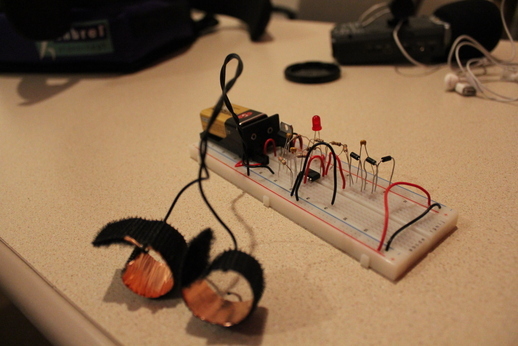 A 10x breadboard and working components is just so darn cool! I can’t wait to pick up a giant LED and stick it into a breadboard someday. The OpenLab by the Melbourne Hackerspace “down under” [Hack Melbourne] really impressed me with their professional design and top-notch documentation. Having used an awful, proprietary classroom lab system in the past, I think OpenLab fills a big need for electronics education. Also, I think their “Team moment of the week” posts on element14 really exemplified what the Challenge was all about: coming together as a team to solve problems and build cool stuff for eduction! Another project that amazed me was TileBot from Artisans’ Asylum in Boston. It’s like a 21st century version of the classic LOGO and its turtle! I think their simple-to-use, yet open-ended system will lead to endless learning and fun for children. Workshop 88, our hackerspace neighbors just a few miles west of Chicago, built the incredibly reconfigurable Educubes. These IR-networked, touch-sensitive blocks can help kids practice math on the fly or just about anything else that can be dreamed up in the software. Finally, I’d like to highlight a kindred DIY biology project in the challenge: BioBoard by Noisebridge in San Francisco. They developed an amazing set of sensors like pH and dissolved oxygen, along with a fantastic web interface with a database backend. Their system can be used by students to investigate biological processes like fermentation. In true spirit of the hackerspace movement, I hope that our two teams will collaborate in the future to make a most excellent DIY biology platform for students to use. Congrats to PS:One and team members Avner Shanan, Shawn Blaszak, Bill Mania, Eric Hanley, Drew Fustini, Kyle Granat, Dan Dumitrescu, and John Stoner on making the next round, and good luck! Next week we’ll be profiling the other two semifinalist projects, BuildBrighton’s Phonicubes and Hackerspace Charlotte’s Feltronics. And we’ll be announcing the winner at Maker Faire Bay Area on Sunday, May 22. This post was sponsored by element14. Besides the requirement that we cover the three finalists in the Great Global Hackerspace Challenge, they had no control over editorial content.